Dia de Muertos, or the Day of the Dead, provides a stunning backdrop for a thrilling supernatural adventure in Mexicana: Deadly Holiday! Guide a young woman as she sets off on a desperate search for her fiance amidst the annual celebration in Mexico. Moments after a spectral figure kidnaps her beloved during a card reading, she begins her journey to the afterworld, where demons will plot her demise and ancients gods will lend her a helping hand. As you travel through a stunning fiery wasteland on your way to a realm of peace and tranquility, you'll search for cleverly hidden objects, solve skillfully designed puzzles, and crack dozens of devious mini-games. Along the way, you'll slowly unfold the astonishing truth of who the young woman really is. 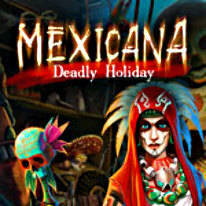 Set in a captivating world, and featuring visuals and music inspired by the Land of Enchantment, Mexicana: Deadly Holidays is packed with thrills unlike any you have experienced!